Attention: Tube-Loving, Vinyl-Spinning, but DIY-averse Wall of Sounders! Our first foray into DIY tubing was a success, judging by the over 22,000(!) views across all sections of the project. A few people actually took the plunge and built their own, too. The two Aikido line stages I built both sold and as far as I know the gentlemen that bought them are happy with their purchases. At least I haven’t had any complaints, yet. But that was almost two years ago, so I reckon it’s time for a new project for lovers of all things tubular. I want to change the game up a bit this time around. 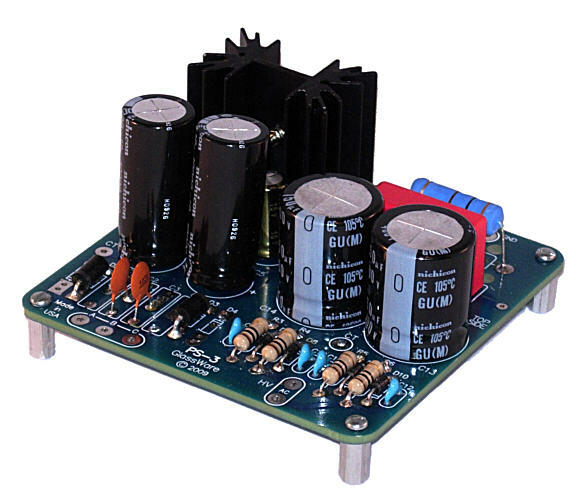 I’m looking for a trusting, but DIY-averse, tube-o-phile to fund an all-tube (no silicon in the signal path) phono preamp. My pitch; the person that fronts this project, if one can be found, will get the finished phono stage assembled, de-bugged, in a nice chassis ready to amplify some sweet sounds from vinyl. The plan is to build another of the kits from Mr. TubeCAD, aka John Broskie, document the process, then post it on Wall of Sound for the benefit of all. I’ll then ship the unit off to the kind patron of this proposed endeavour. Tube-shy audiophiles concerned about the cost of re-tubing needn’t worry. A fresh set of four tubes can be had for about 50 dollars US. Phono preamps can be trickier than line stages, but I’ve built a few over the years, and the latest ones have all been successes. I’ve also discovered a few tricks to help make them immune to a lot of the RFI and EMI present these days. The leadoff picture is of the Tetra Sans PS prototype that I built using Broskie’s phono board, PS-3 power supply, and some parts I had going spare. The chassis is a donor reclaimed from a project that…well, let’s just say a project I gained some valuable experience on. The Tetra powered up without drama and went about its work amplifying without any fuss or bother. An audiophile friend owns a Tetra and has used it daily for over two years. We had better talk some numbers. I estimate that a complete phono preamp, in a nice case, tubes included, ready to plug and play could be built for $490 US for those located in the USA. In Canada about $695 CDN will be required by the time the tax man gets his slice. The person that funds this project will get the metal working needed on the chassis, PCB assembly, wiring and testing provided by yours truly, in short all the labour, free of charge. For the not-so-DIY-averse, the plan for assembly, assuming we go forward with this, will be much easier than the Aikido line stage project of 2016. This time around I will simplify the chassis layout to the point where drawings will not be necessary and only a ruler will be required for the layout. All holes required in the chassis will be small and thus done with a handheld, two-speed drill. The services of a tool maker or machine shop for assistance with the metal working will not be needed. The only special mechanical tools needed, aside from the power drill, will be a couple of centre punches, a centre drill or two, a few drill bits and two inexpensive countersinks to de-burr the drilled holes. Of course, a soldering iron, some solder, pliers and screw drivers will be required. For DIY’ers that like to colour outside the lines (you know who you are), the Tetra Phono would no doubt respond positively to some fancy audiophile capacitor upgrades. But these aren’t needed to get a good sounding unit. My prototype has 50 dollars worth of scavenged Mundorfs and it sounds sweet enough that I’m going to use it to digitize some vinyl using the Schiit JIL A to D converter that I reviewed earlier this year. So, if anyone would like to fund this project and get a really decent phono preamp that would compete sonically with commercial units costing upwards of 2,000 dollars, please drop the WOS editor a line at info@wallofsound.ca and he will pass it along to me. Editor’s Note: I was also a very pleased recipient of Steve’s Aikido linestage, and I recently bought the excellent RJM VSPS400 Phono that Steve built, with the proceeds going to charity. I can vouch for (a) the quality of Steve’s work, it’s first rate, and (b) that his projects happen quickly – you won’t be waiting months for this to materialize. Tim, thank you for your interest in Wall of Sound. Yes I noticed the new Aikido PH-2. 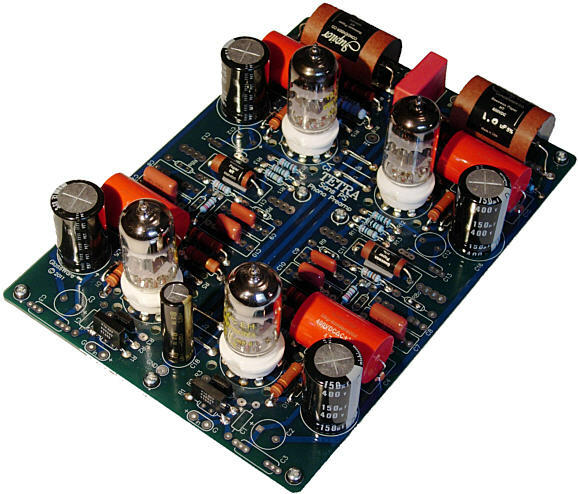 The one I propose to build is the four tube Tetra Phono. If someone is interested in the 8 tube PH-2 instead of the Tetra I’m game. It is however more expensive to the tune of US $300 to $350 on top of the cost the cost I estimated for the Tetra.